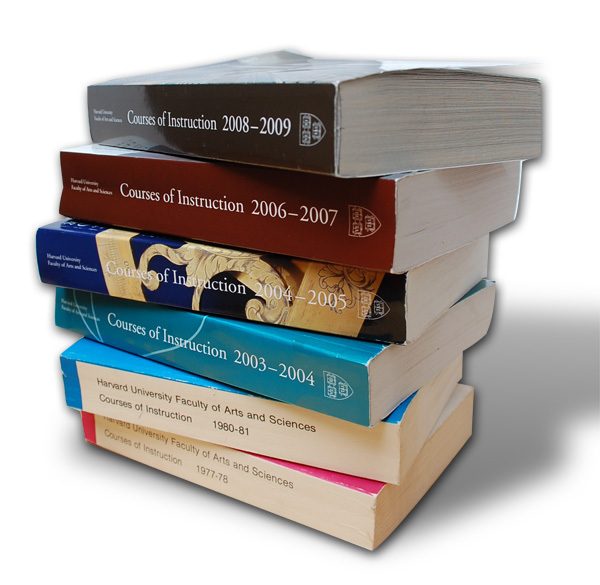 On April Fools’ Day, but in all seriousness, the Faculty of Arts and Sciences announced that the Courses of Instruction catalog, undergraduate and graduate student handbooks, Q Guide (to course evaluations), and faculty-instruction handbook would henceforth be available only online. Registrar Barry Kane said of the decision, “A majority of our students and many members of the faculty and staff conduct most of their business online.” He also cited the environmental and financial benefits of eliminating printed volumes, and the advantages in keeping information on courses up to date and making more data searchable. This end of an era prompted the following extended reflection on the gains, and losses, associated with digital communications from McKay professor of computer science Harry Lewis, former dean of Harvard College, on his blog, www.bitsbook.com/blog—named after the book Blown to Bits, of which he is coauthor, and his Core curriculum course, “Bits” (Quantitative Reasoning 48, described at page 40 of the 2008-2009 Courses of Instruction). Harvard announced yesterday that it would no longer print the course catalog, the Handbook for Students, and a few other softcover volumes that are issued annually to students and faculty. The admissions office had already announced that it would cut down on the amount of printed matter it sends to high-school students. The rationale for doing less printing is, of course, cost savings—Harvard is undergoing significant budgetary contraction. It’s a bit sad—I have a collection of Harvard course catalogs going back to about 1850. The earliest ones, before [President Charles William] Eliot abolished most curricular requirements and instituted the elective curriculum, had the course schedule printed on a single page: Hours of the day across, days of the week down, and four lines in each box, indicating which course would be taken by freshmen, sophomores, etc. at that time on that day of the week. I’m going to add this year’s, which is hundreds of pages long, as the last one in the collection. If I can find it. I think it’s in the office somewhere, but I’ve never looked at it, since it’s generally easier to use the Web version. And that, of course, is the reason this move makes so much sense. The online catalog is searchable, and it’s also up-to-date—there are always additions and deletions to the list of courses after the catalog goes to print. Still, books are more browsable than online text. Though user interfaces keep getting improved, there is nothing with the high bandwidth of flipping through the pages of a book, creating the opportunity for the marvelous human visual system to catch a word flashing by. And computers are still awkward to read in bed. Harvard couldn’t have considered dropping the printed catalog until the Internet became ubiquitous—or at least ubiquitous on campus. The fact that it’s far from ubiquitous in many parts of America poses a challenge to the electronic outreach efforts of the admissions office. One of my colleagues poses an interesting question. The Registrar has always posed a strict 200-word limit on our course descriptions, to prevent our enormous course catalog from becoming gargantuan. But bits are cheap. If we hold to the 200-word limit, it will be another example of a social restriction we used to justify by economic necessity, but which we sustain because we decide that the discipline is good for us even after technology has gutted the economic justification. There are many other examples in Blown to Bits—for example, the regulation of speech on U.S. broadcast radio and television. And then there’s the question—will some pack-rat, a century and a half from now, be able to assemble a collection of Harvard course catalogs, to compare and contrast? What confidence can we have that institutions on which we rely to provide online information will keep their archives visible forever? Not lately, but I sure did when I was a student. When I spotted a course called “The Later Philosophy of Wittgenstein,” I thought that was so cool (like, do they alternate that with a course on the early philosophy of Wittgenstein, or offer them both some years?). At the time I had no idea who he was. I wound up taking not just that but about three other philosophy courses. So that kind of browsing was actually really important to me educationally. …[T]he catalog used to be a fabulous recruiting tool for academically oriented kids. In flusher times, the admissions office used to take the leftovers at this time of year and give them away to admitted students during the current courtship period [to encourage them to attend Harvard]. Some of them would get that same exhilaration I remember, and decide that going to some nice liberal arts college where the faculty would bring you milk at night was actually not what they wanted. It’s a window on our world that I don’t think a website really is (on the other hand, I acknowledge not being 18 years old today).